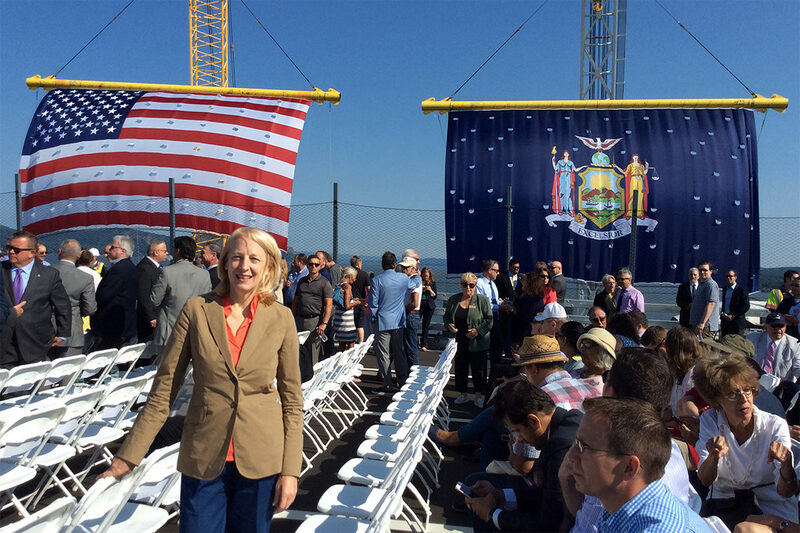 TWMLA principal Kathryn Wolf attended the ribbon cutting ceremony held to celebrate the recently completed and opened first span of the new Governor Mario M. Cuomo Bridge. Spanning the Hudson River, the Bridge replaces the former Tappan Zee Bridge and provides crucial connections between the New York City Metropolitan area and upstate New York. Once completed, the new bridge will feature a TWMLA designed shared use path and six unique viewing areas over the three-mile span. This shared use path provides pedestrian and bicycle connections that did not exist on the former bridge. At $4 billion, the replacement of the Tappan Zee Bridge is one of the largest construction projects in the nation, and the biggest in the history of the New York State Thruway Authority.